And the day has finally dawned upon us. 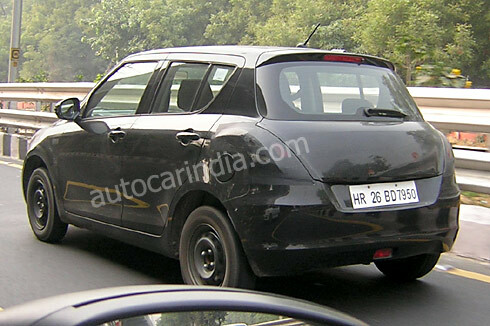 Maruti Suzuki has started testing the third generation Swift around the Indian cities. The first pic comes to us from Delhi where the new car is caught in some heavy camouflage. Officially launched in India in March 2005, Maruti quite literally owned the hatch back market by selling more than a Million units till date. And why not, this car was all- things-to-all-people; some (including me) have even quoted it to be the Indian MINI. But in 5 years the game has moved on, sadly the Swift didn’t. Superminis like the i20, Jazz, Fabia et all are getting more spacious, more luxurious, more feature laden, even more powerful. Combine that with global giants like Toyota and Honda flexing their muscle for a share of the hatchback pie and it has spelled trouble for the little Swift, which mind you, is still the lion of the mountain. So it is obvious, the largest manufacturer in India will not just sit around with its hand folded. The new car has already been launched in a few countries across the world and has been appreciated by international automotive press. The car has been widened by 50 millimeters, so expect more space (an Achilles heel of the outgoing car). The international car has a 1.2L, 92 bhp, VVT petrol engine so expect the same engine with slightly less power. We also expect a 1.3L DDiS (diesel) engine to do its duty religiously. Design-wise, the new car has matured with sloping headlights and tailights giving the car a much aggressive look. You can still see some hints of the old car in the design, which is a good thing as if you sell 1 million units of something; you don’t change the recipe completely. Interior wise, the new car is really a step forward. The old car lost to its new rivals big-time on the interior front. New car features a perfect blend of sporty combined with truly functional interiors. A three spoke steering wheel coupled with a short-shift gearbox definitely adds to the flavor. So if you think about it, on paper, this car is truly a winner. But then again that’s just on paper. Maruti cannot afford to get this car wrong as for 5 years it has been their bread-butter. Will Maruti be able to repeat what BMW did with the new MINI? Will the new Swift really dominate the market like its predecessor? The answers to all these questions will be answered early next year. But that shouldn’t stop you from giving your views below.